Indoor plants today provide style to the home. Indoor plants provide a transition from nature to our domestic living space. Indoor plant arrangements in diverse and creative containers have gained popularity. As opposed to being innocent living defenseless and sympathetic individuals stuck in a corner, today’s indoor foliage breathes life into a home. Indoor plants help clean the air, provide oxygen and brighten our spirits. This can be done in a stylish way. It wasn’t always that way. 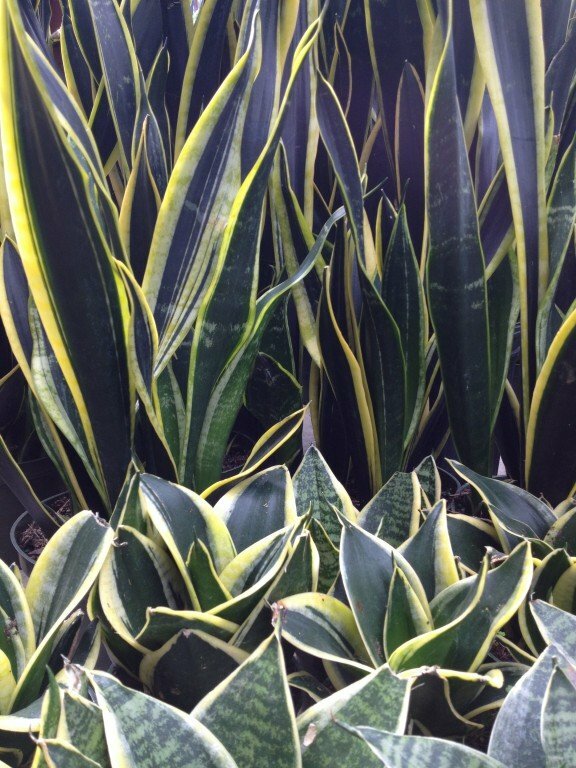 Foliage plants like these Sanseveria (pictured) are a welcome and healthy addition to any home! Years ago indoor gardening meant a Ficus, Dieffenbachia or Dracaena plant stuck in a corner losing half its leaves in winter. A token Fern basket would hang deprived of the humidity it needed because of dry furnace air and then maybe a Christmas cactus and an African violet on the windowsill. Today Orchids, Tillandsia, Succulents, Herbs, Fiddle leaf Fig, Sanseveria, Palms and more to name a few have become main stays of the stylish indoor garden. If you are prone to an eclectic mix of plants I have a suggestion. Most people tend in this direction because most plants are purchased without a plan. Inspiration and impulse influence our plant purchases. That’s OK because a mix of textures and sizes in plants gives depth to your décor. I would pay attention and make investment in the containers, the “homes” for your houseplant friends. A good quality container has enough space for roots to grow and allows for drainage. A good quality container also adds to the style of your interior plant arrangement. With a variety of colors, textures and forms to your plants you can unify your living space by coordinating the containers. Even though the plants are varied, a consistent style and color of container in various sizes can unify or pull the whole décor together. As a matter of fact, I recommend for the interior what I recommend for our outside landscape. Monocultures are not a good idea. When a problem develops it spreads like fire in a monoculture. Diversity is a good thing. Celebrate it with your plants and visually tie them together with a consistent planter theme. Finally don’t forget about Poinsettias to add color to our indoor plants in December. 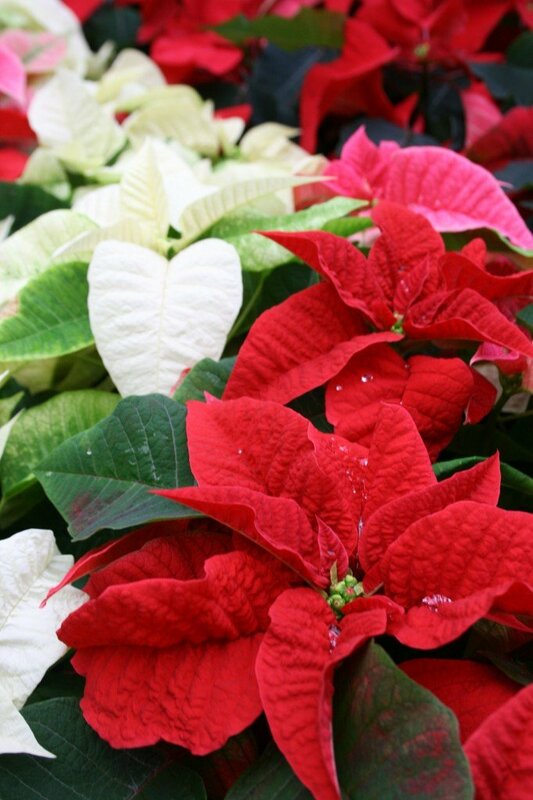 Today’s varieties of Poinsettia are colorful with long lasting bracts. They like other houseplants don’t like cold drafts. Don’t place them near heat registers, room temperature will do just fine for them. Don’t overwater them (too much water is the number one killer of houseplants) and make sure to provide drainage if they are foil or deco wrapped in a fancy pot cover. Indoor plants are our friends and help bring an interior space to life. They truly are the gift that keeps giving.